The data trove unearthed by the near-final version of iOS 11 continues to bear fruit, with the latest gleaned data suggesting that the 'A11 Fusion' processor expected to be in the iPhone X has two cores for intensive processing needs, and four high-efficiency cores. Unearthed by Steve Troughton-Smith on Sunday, the iOS 11 leak from the end of the week reveal CPUs labeled 0 through 5 —a total of six. Without expanding on further delving, the developer originally claimed that four are the high-powered "Mistral" cores, with two "Monsoon" cores supplementing the four for lesser computational needs. For comparison, the A10 Fusion processor in the iPhone 7 and iPhone 7 Plus has a pair of high performance cores, and a pair of high efficiency cores. The A10X in the iPad Pro refresh from WWDC has three high performance "Hurricane" cores, and three high efficiency "Zephyr" cores. The A10X in the iPad Pro was the first consumer device built on TSMC's 10nm chip fabrication process. In all likelihood, the "A11 Fusion" processor will be based on the same size process. To keep the iPhone X running at peak efficiency, as with the iPhone 7, the two types of cores are likely driven by a Apple's traffic-regulating chip, delivering tasks with low computing power demands to the high efficiency cores, and heavy duty tasks to the high power cores. Practically, this means that tasks like e-mail checking and music playing will be handled by the high efficiency cores, preserving battery life when in use much better than if the tasks were dealt with by the high power chips. 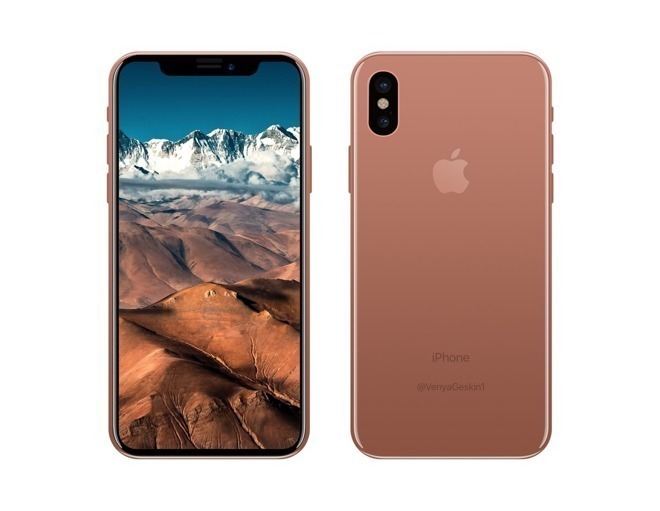 It is not clear from the delve if the hexacore A11 Fusion is in the iPhone 8 and iPhone X, or just in the iPhone X.
Apple is expected to announce three new iPhones with the high-end OLED model, and two other devices expected at a Sept. 12 press event. Also predicted is a refresh of the Apple TV adding 4K video as a playback option, and an LTE-equipped Apple Watch. Update: The six cores were "clarified" by the discoverers later on Sunday, with the current prediction being two of them having the higher power, and four of them being the low-power, high power efficiency model.